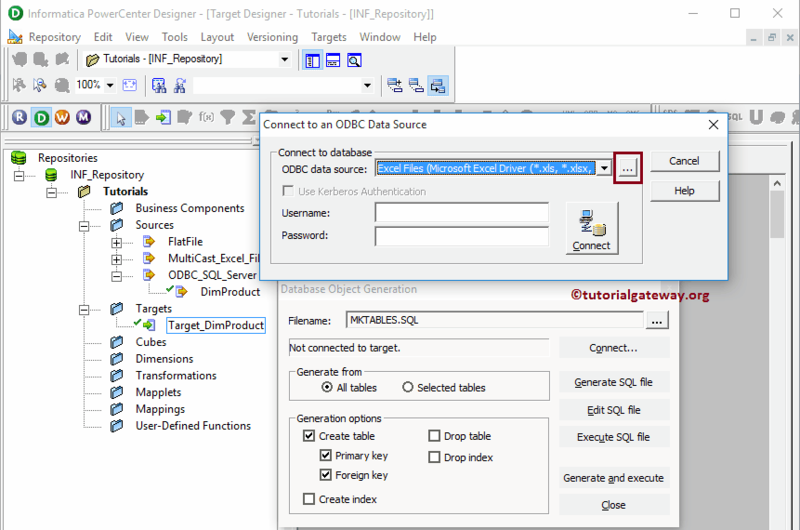 In this article, we will show you, How to create Informatica target table using source definition that exists in the Sources folder and use it as the destination/target table for the transformed data with an example. For example, If we want to copy or use the source definition as your target definition then, this will be the best bet for you. Before we start doing anything, First connect to Informatica repository service with your Admin credentials and then Navigate to Target Designer. 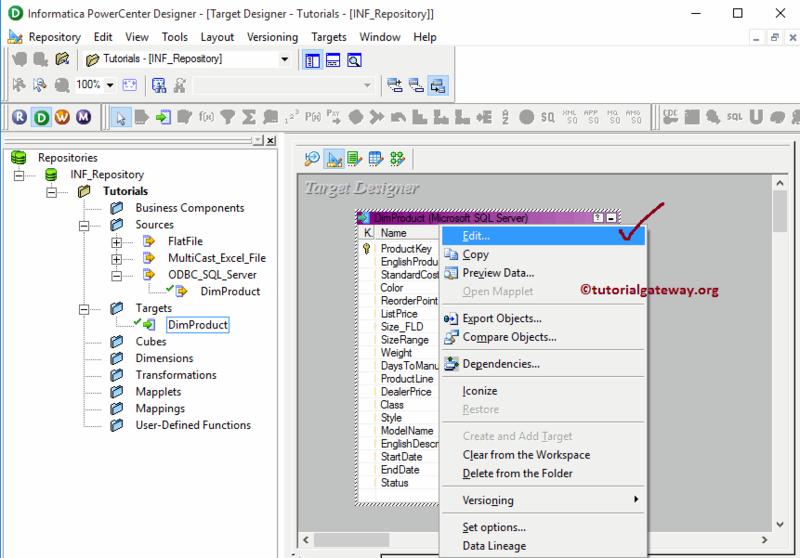 Please refer Target Designer in Informatica article to understand the Target Designer screen. From the below screenshot you can observe that we are in the Target Designer. TIP: Target Menu in the Menu bar will be available only when you are in the Target Designer section otherwise, it will be hidden. Drag and drop the DimProducts from the Sources subfolder to the Target Designer. 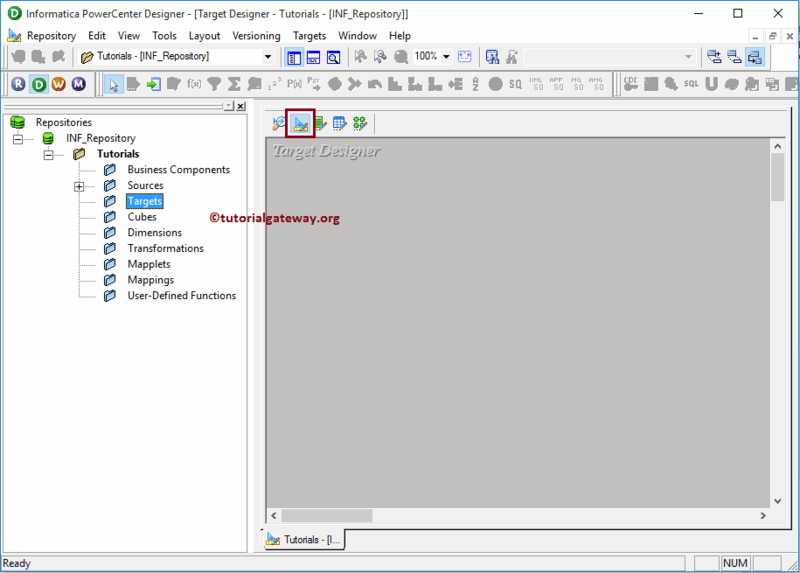 The PowerCenter target designer will automatically create Informatica target table using source definition. From the below screenshot you can observe that under the Targets subfolder you can see our newly created target in Informatica and the table definition (Column Names and appropriate data types) inside our workspace. Although we copied the DimProducts table from source definition, we may not require all the columns present in that table. To resolve this, we can edit the table by Right click on the table definition and selecting the Edit.. option from the context menu. If you want to delete columns then select the unwanted columns and click the scissors button as shown below. Step 1: Please navigate to Targets menu in Menu Bar. 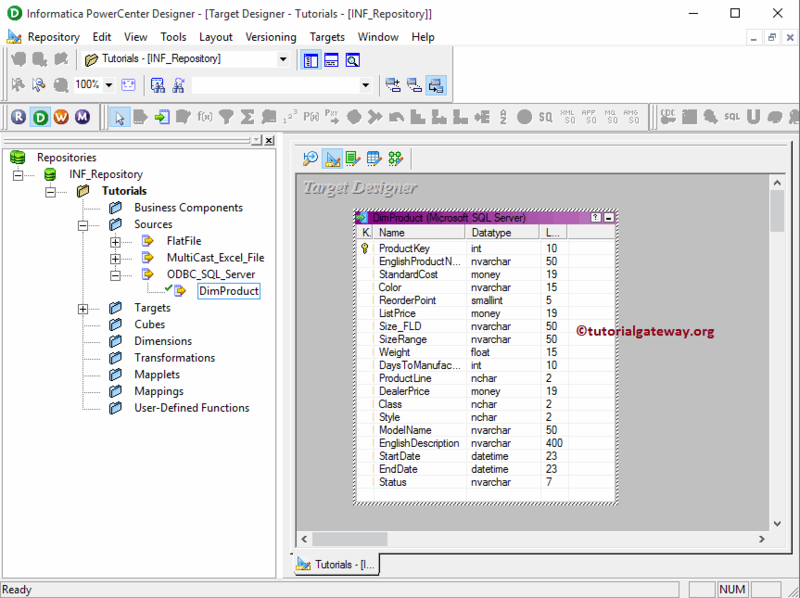 From the following screenshot, you can observe the list of available targets inside the Informatica PowerCenter Designer. 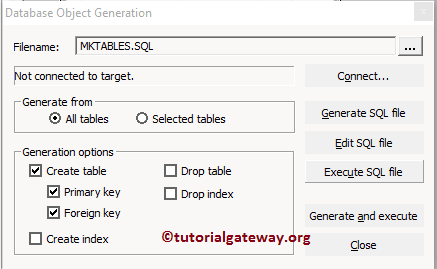 In this example our task is to create Informatica target table using source definition so, we are selecting the Generate/Execute SQL.. option as shown below. 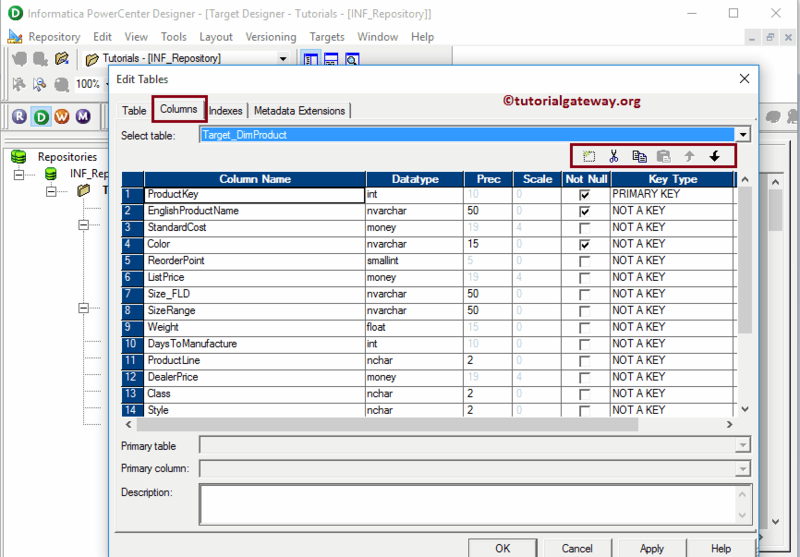 All tables: If you want to generate and execute the SQL file for all the tables exist in our Target Designer then, you have to select this option. 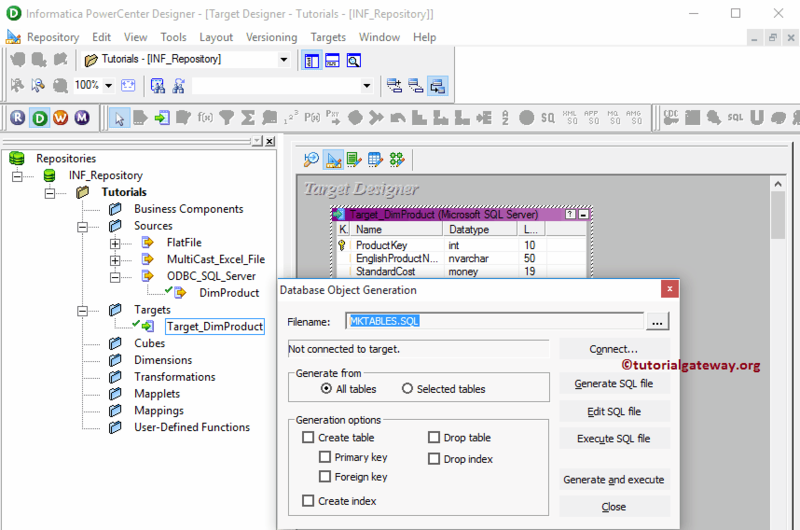 Selected tables: If you want to generate and execute the SQL file for the selected table(s) in our Target Designer then, you have to select this option. Create Table: If you want to create a new table in our database then, Please check mark this option. Create Primary Key: If you want to add a primary key to that table then, Please check mark this option. Create Foreign Key: If you want to add a Foreign key to that table then, Please check mark this option. Create Index: If you want to create a new index on our table then, Please check mark this option. Drop Table: If you want to drop the existing table (if there is any with the same name) from our database then, Please check mark this option. Drop Index: If you want to drop the index name then, Please check mark this option. Generate SQL: This button will generate the SQL query of the target definition. 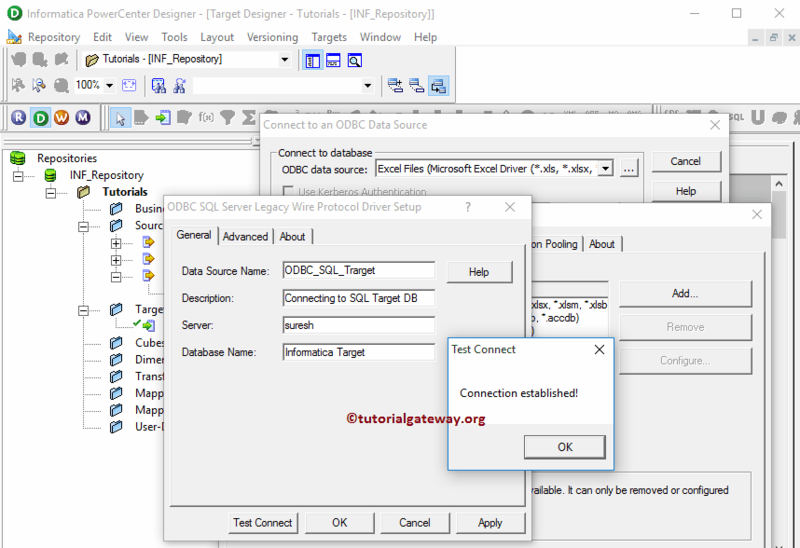 Edit SQL File: This button will help you to edit the generated SQL file and allow to make changes as per our requirements. 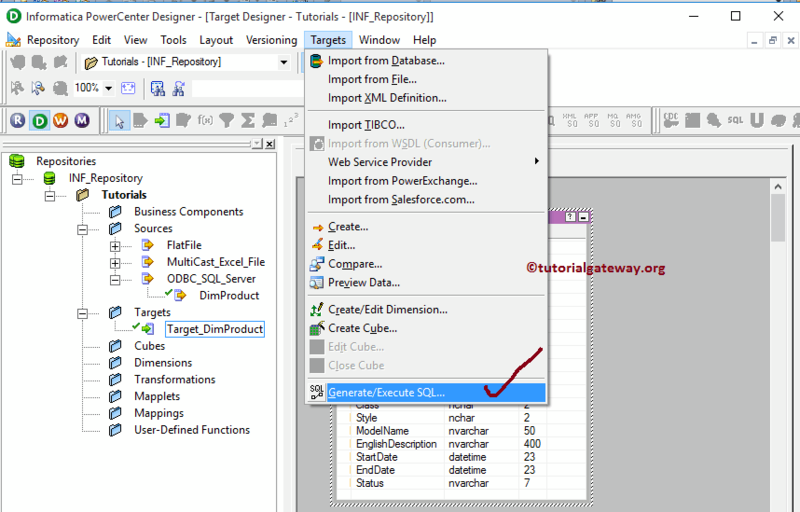 Execute SQL File: This button will execute the generated SQL file. 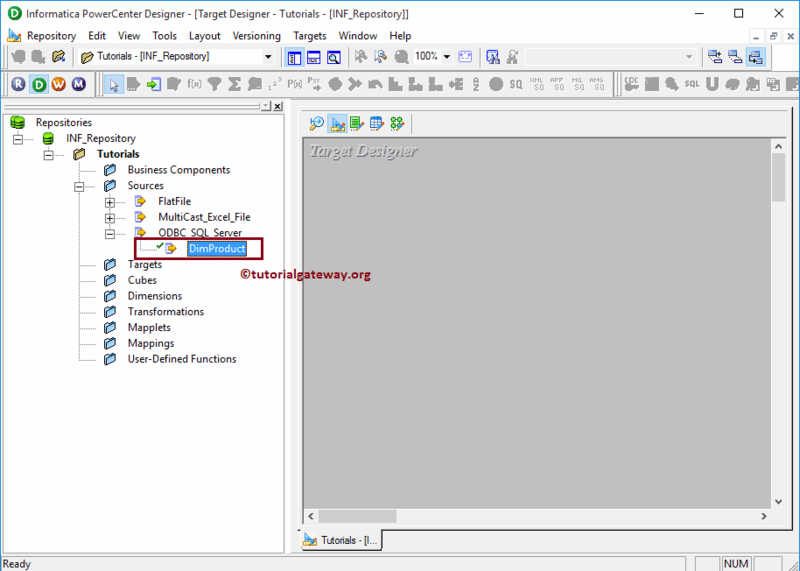 Generate and Execute: This button will generate the SQL query of the target definition and execute the generated SQL file. 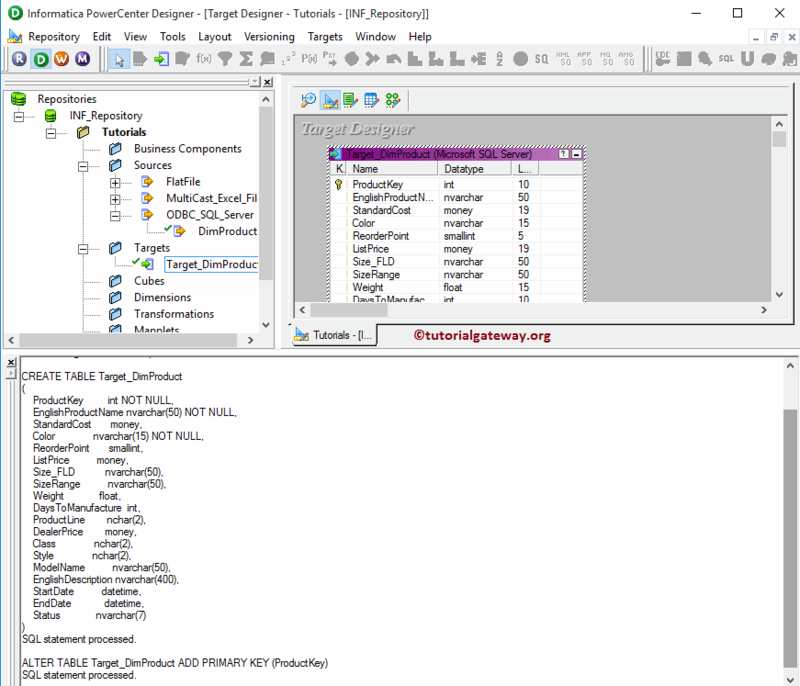 Step 3: From the below screenshot you can observe that we are selecting Create Table, Create Primary Key and Create Foreign Key. We are not dropping anything because our database is new and empty. 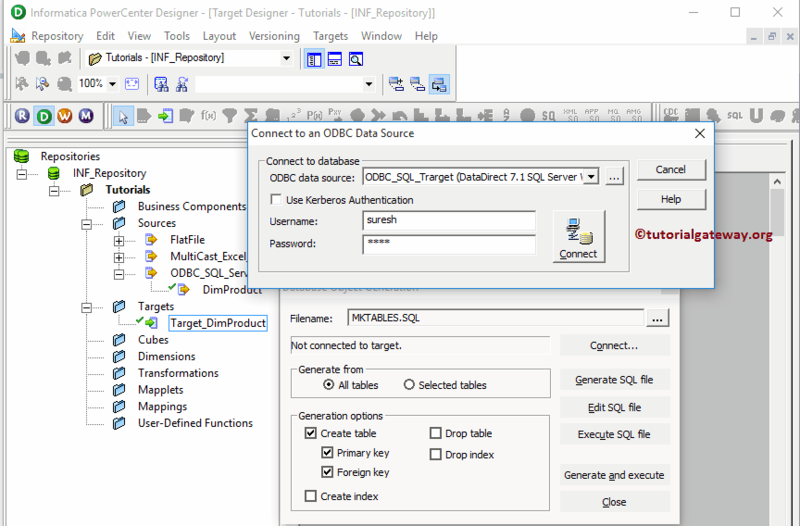 Step 4: Once you click on the connect.. button, Connect to ODBC Data Source window will be opened to select the existing ODBC connection or to create a new one. Currently, we don’t have any so, we are creating a new one by clicking on the … button as shown below. 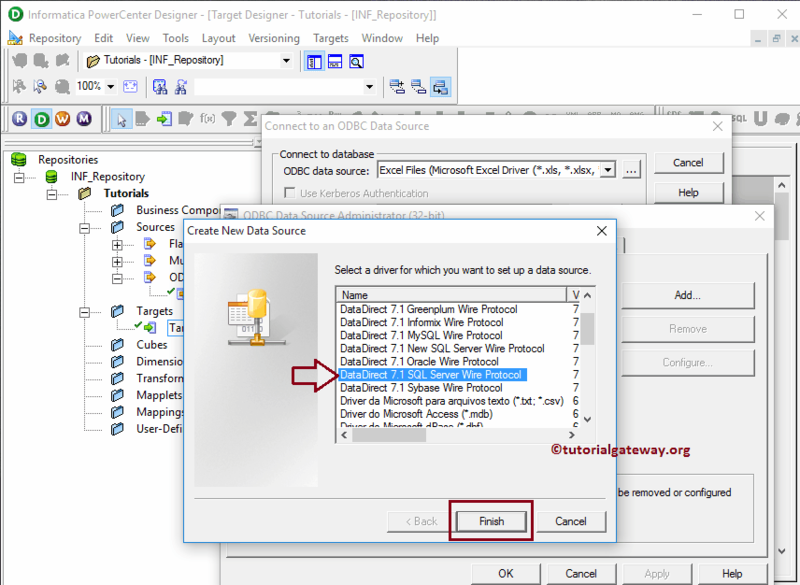 Step 5: Once you click on the … button, ODBC Data Source Administrator Window will be opened to add a new ODBC connection. If you have any then please select it from the list. In this example we are adding a new connection so, Click on the Add button. Once you click on the Add button, Create New Data Source window will be opened. Here we have an option to select the required database from the available list. As we said before, we are using SQL Server so we are selecting the DataDirect 7.1 SQL Server Wire Protocol for this example. TIP: Please refer Informatica ODBC Connection to understand the steps in detail. Step 6: This will open the new pop up window called ODBC SQL Server Legacy Wire Protocol Driver Setup. Here we have to fill the required details to connect with our database. Data Source Name: Please specify a unique name for this ODBC Connection. Database Name: Here you have to write the SQL database name from which you want to extract the data. For the time being, we are selecting the Informatica Target. Step 7: From the drop-down list, Please select the ODBC connection that we created now. Step 8: Next, We have to provide the credentials required to connect with the respective database. Here we are providing the Username and password of our Microsoft SQL Server 2014 and owner name as dbo. From the below screenshot you can observe that we successfully generated the Target table inside our Microsoft SQL Server 2014.